Here is a link to what Martha Stewart calls easy basic pancakes. Haters may stop reading now. Some of the elements of this recipe come as a surprise. First, she says to put all the liquid ingredients together and add the dry ingredients. Since the Eisenhower administration I have been adding liquids to dry ingredients with perfectly adequate results. Second, she says to double a paper towel, put some oil on it and wipe it about the skillet. This is after heating the skillet to medium. I don't know about you, but paper towel-wise I would want to fold it at least thrice to assure a thickness that will avoid discomfort to my fingers as I am spreading the oil. Third, the size of the pancakes seems odd. She says to spoon 2-3 Tablespoons of batter onto the greased skillet. 2 Tablespoons = 1/8 cup. One commenter said that she liked big pancakes and this recipe made two, the first of which was thin and dense and the second of which was perfect. Go figure. I believe that the perfect size for a pancake is about one inch less in diameter than the central portion of the plate upon which you intend to serve it, allowing a half inch border all around in which excess syrups and toppings can pool. What do you think? Based on Felicity Cloake's "perfect pancake" recipe that Julia made, I mixed up my own version for the following morning's breakfast. 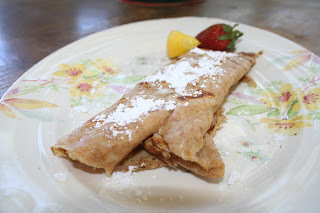 They turned out a bit thicker than crepes, and thinner than pancakes, so I am calling them "PanCrepes"
While the original recipe left us with only 1 crepe each (perfect little meal before our day hike) this one filled us up with a total of 5 PanCrepes. Whisk until an even consistency with no lumps. Pour onto non-stick frying pan with olive oil over med./low heat. Flip once you can see the bottom has hardened around the edges and cook for another minute. We enjoyed ours with grape jelly and blueberries wrapped inside. 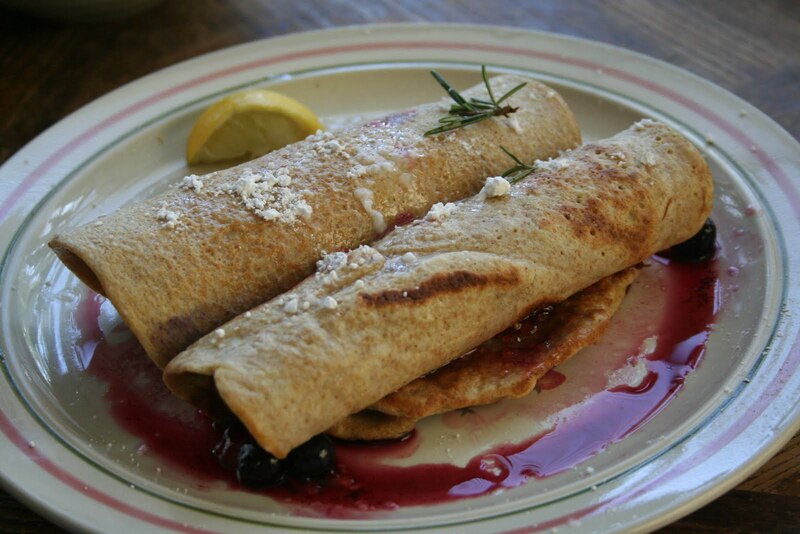 Mardi Gras also goes by the names "Shrove Tuesday" and more importantly, "Pancake Day." Pancake Day falls annually on the Tuesday before Lent begins and is an opportunity to pig out on all the yummy things you won't be enjoying during the ritual 40-day fast. I didn't get around to this during Lent, but, I sampled several pancake day recipes provided by the UK's Guardian. Pancake Day is known as such in the UK where pancakes aren't eaten regularly (what a shame!). I used Gourmet Sleuth's gram conversion calculator to translate from the metric system into cups and tablespoons. I started with Nigel Slater's crepes with apples, waited a few days, tried to burn some calories, and then moved on to Felicity Cloake's "Perfect Pancakes". I recommend watching Felicity's video BEFORE you make the pancakes as she voices some essential tips about temperature and pan diameter. I have yet to try Hugh Fearnley-Whittingstall's recipes but I'm curious to know how his sweet potato pancakes turn out. Try them on your own and let me know! I was so hungry by the time I finished cooking up Nigel Slater's pancakes that they were gone before I could grab the camera. Pictured is my feeble attempt at Felicity's perfect pancakes. As usual, I substituted regular flour with wheat flour. Both recipes involved some tweaking due to the approximate metric to US measurement conversion. Be sure to monitor the pan's temperature as well, as these crepes are more temperamental than their thicker and fluffier cousins from across the pond. You may want to double Felicity's recipe. My first crepe was a failure: I didn't stir the batter before pouring, I didn't wait patiently until the pan was at the right temperature, and I was using too large a pan. Even despite these errors, my efforts yielded only 2 crepes. For both Nigel and Felicity's recipes, I topped mine with powdered sugar and fresh lemon juice (a resident of Southern California, I borrowed a lemon from a neighbor's tree). These are definitely recipes I will have to revisit until perfection is achieved. The beauty of the perfect pancake is in the simplicity of the 3-ingredient recipe. Bon Appetit! Here is a link to a discussion of the physics of pancakes from the Los Alamos National Laboratory. It explains why pancakes would be smaller but thicker on the moon. Hi Pancake Zen readers! My name is Julia and I am a guest contributor to pancakezen.com. 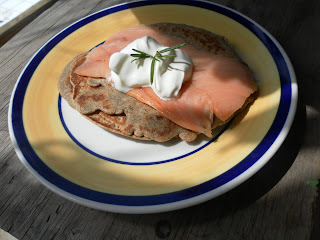 My first entry is about blini (plural). Blini are traditional Russian pancakes made with buckwheat and should be thin enough to see through. They can be topped with any number of ingredients including salmon and sour cream or, for the well-heeled, creme fraiche and caviar, paired with champagne. I tend to substitute sometimes when I cook, with varying results. I tried to follow instructions for this blini recipe, courtesy of Ina Garten, only substituting the all-purpose flour with whole-wheat flour, and skipping the salt (which my boyfriend thinks is just plain evil), and using 2 large eggs instead of one extra-large. I had to add a bit of water to compensate for the extra egg. Several other recipes instructed that the milk be heated, so I microwaved for 40 seconds. My boyfriend Josh and I enjoyed ours (pictured) with smoked salmon, creme fraiche, and fresh rosemary (though dill is more traditional). Josh's roommate Daniel went the pancake route and topped his with maple syrup. Traditional sweet toppings for blini include jam and honey. Cheers! On request, I am linking to a recipe for crepes from Alton Brown, revered in our household for his culinary instruction, if not for his humor.